Guy Laliberté, OC CQ (born 2 September 1959) is a Canadian businessman, investor, poker player, and musician. Along with Gilles Ste-Croix, he is the co-founder of Cirque du Soleil. With an estimated net worth of US$1.37 billion (as of January 2018), Laliberté was ranked by Forbes as the 11th wealthiest Canadian and 459th in the world. Following an announcement from the Cirque du Soleil on 20 April 2015 concerning a change in ownership, Laliberté will maintain a stake in the business and will continue to provide strategic and creative input to the company. Starting out busking as an accordion player, stiltwalker and fire-eater, in 1984 Laliberté founded Cirque du Soleil, a Canadian circus company whose shows have since been seen by more than 90 million people worldwide. In 2006, Laliberté was named the Ernst & Young Entrepreneur of the Year. Laliberté was born in 1959 in Quebec City, Quebec, Canada. His interest in show business began at a relatively young age. His parents took him to watch the Ringling Brothers and Barnum & Bailey Circus, an experience which led Laliberté to read the biography of P. T. Barnum. While he was still in school, Guy produced several performing arts events. After school, he entered the world of street performance, playing the harmonica and accordion on the streets of Quebec. Laliberté joined a performing troupe called Les Échassiers, which included fire-breathers, jugglers, and acrobats who hitched around the country from show to show. He later returned to Quebec, where he attempted to keep a steady full-time job at a hydroelectric dam. However, soon after his employment began, the company's employees went on strike. Laliberté took the opportunity to return to his life as a street performer. In 1980, he ran as a Rhinoceros Party candidate for the electoral district of Charlevoix in the 1980 federal election. Guy Laliberté co-founded Quebec's first internationally renowned circus with Gilles Ste-Croix and a small group of colleagues. He recognized and cultivated the talents of the buskers from the Fête foraine de Baie-Saint-Paul and created Cirque du Soleil in 1984 with the support of a government grant for the celebration of the 450th anniversary of Jacques Cartier's discovery of Canada. Cirque du Soleil was originally set up as a one-year project. However, the government of Quebec wanted a touring event that would perform in other provinces. The name 'Cirque du Soleil' ("circus of the sun"), which Laliberté came up with while he was in Hawaii, reflects his notion that "the sun stands for energy and youth" and that the circus is about those two words. In founding the company, Guy Laliberté was assisted by Gilles Ste-Croix. It is said that Laliberté is the "father" of Cirque du Soleil while Ste-Croix is the "grandfather." Since 1984, Laliberté has participated in the creation of every Cirque du Soleil show. Cirque du Soleil has become a sprawling international operation, as much in terms of its makeup as in the scope of its activities and influence. The organization now has activities on five continents. Its shows employ approximately 4,000 people from over 40 countries and generate an estimated annual revenue exceeding US$810 million. 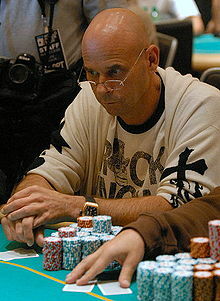 In April 2007, Laliberté finished fourth in the World Poker Tour Season Five event at Bellagio in Las Vegas and won $696,220. Laliberté also played on GSN's High Stakes Poker Season 4 show and took part in Poker After Dark season 4. He was also known for frequenting the highest stakes games on Full Tilt Poker. In 2011 Laliberté announced the Big One, a $1 million dollar buy-in tournament which was featured at the 2012 World Series of Poker. Part of the prizepool was donated to Laliberté's philanthropic organization One Drop Foundation. 48 players participated in the tournament and Antonio Esfandiari won the $18,346,673 first-place prize. The tournament raised $5,333,328 for the One Drop foundation. 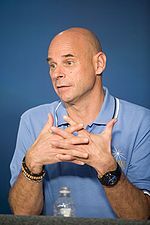 In September 2009, Guy Laliberté became the first Canadian space tourist. His spaceflight was dedicated to raising awareness on water issues facing humankind on planet Earth, making his spaceflight the first, in his words, "poetic social mission" in space. The event was accompanied by a 120-minute webcast program featuring various artistic performances in 14 cities on five continents, including the International Space Station. In June 2011, Laliberté published a book, entitled Gaia, containing photos of Earth from his 2009 trip to the International Space Station. Proceeds from his book are to go to the One Drop Foundation. Guy Laliberté became in 2007 the owner of the atoll of Nukutepipi in the French Polynesia. Major works that took place there were expected to end in 2016 at the cost of approximately CA$20 million, according to Journal de Montréal (see below). In May 2014, Guy Laliberté told the Journal de Montréal that he wanted to make of this place a shelter that could accommodate his family and friends in the event of a global catastrophe. "Because of all that's happening in the world, I said to myself: that could be the place where, in case of an epidemic or a total war, I could bring people I like and my family so that we'd be protected. It will be completely autonomous on the level operation: solar, environmental, ecologic." Université Laval (Québec) awarded an honorary doctorate to Guy Laliberté in 2008. The year before, Guy Laliberté took the Ernst & Young Entrepreneur of the Year award for all three levels: Quebec, Canada and international. In 2004, he received the Order of Canada, the highest distinction in the country, from the Governor General of Canada. The same year, he was recognized by Time Magazine as one of the 100 most influential people in the world. In 2003, he was honored by the Condé Nast group as part of the Never Follow Program, a tribute to creators and innovators. In 2001, he was named a Great Montrealer by the Académie des Grands Montréalais. In 1997, Guy Laliberté received the National Order of Quebec, the highest distinction awarded by the Government of Quebec. On 22 November 2010, he and Cirque du Soleil were honoured with the 2,424th star on the Hollywood Walk of Fame. Laliberté's son Kami is a racing driver currently competing in the European junior formulae. ^ Forbes Guy Laliberte – Forbes Forbes.com. Accessed May 2011. ^ "Cirque du Soleil Finds New Strategic Majority Partner In TPG-Led Investor Group". Cirque du Soleil. 20 April 2015. ^ Frank, Steven (26 April 2004). "Guy Laliberte Revolution Under the Big Top". Time. ^ a b c d "Biography Guy Laliberté". Cirque du Soleil. Archived from the original on 2011-05-08. ^ a b "The Circus Kid: Guy Laliberté Is Born". Evancarmichael.com. ^ Jag (1959-09-02). "Guy Laliberte Biography – Guy Laliberte Bio". Celebs101.com. Retrieved 2011-03-10. ^ "Rhino Party promises to nationalize Tim Hortons, move capital to Kapuskasing". Toronto Star, 18 August 2015. ^ Collins, Glenn (2009-04-29). "Run Away to the Circus? No need. It's Staying Here". The New York Times. Retrieved 2011-03-10. ^ "Official Cirque du Soleil Website". Cirquedusoleil.com. Retrieved 2011-03-10. ^ "WSOP to host $1m tournament". Poker Player. 1 June 2011. ^ Moskowitz, Clara (28 June 2011). "Earth's Beauty From Space: Q&A With 'Space Clown' Guy Laliberte". Space.com. Retrieved 28 June 2011. ^ Ménard, Élizabeth (25 April 2015). "Le nouveau cirque de Guy Laliberté : L'atoll de Nukutepipi". Journal de Montréal (in French). ^ "Guy Laliberte Honored On The Hollywood Walk Of Fame". Dance.broadwayworld.com. 2010-11-22. Retrieved 2011-03-10. This page was last edited on 30 December 2018, at 19:02 (UTC).